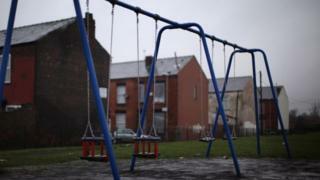 Nearly half of children in some parts of the UK are living in poverty, a study has said. More than 3.5m children are affected with the problem worse in large cities, especially London, Birmingham and Manchester, the End Child Poverty Coalition said. The group warned low income families "won't be managing tomorrow" if prices rise and benefits are cut or frozen. The government said it was tackling poverty and its "root causes". The highest levels of child poverty were found in Birmingham's Ladywood, where 47.3% of children were affected and Manchester Central where nearly 45% were included. Meanwhile, in London's Poplar and Limehouse, 43.7% of children were poor. A household is deemed to be in poverty if its income is less than 60% of the median, the coalition of charities, faith groups and unions said. The coalition said its figures are estimates calculated using Her Majesty's Revenue and Customs (HMRC) data and the Labour Force Survey. Areas with the lowest levels of child poverty included Sheffield Hallam and York Outer. Meanwhile, more than 200,000 children in Scotland are growing up in poverty, the study suggested. Sam Royston, End Child Poverty chairman, said: "Our children are now twice as likely to be poor as our pensioners. "Many families who are just about managing today won't be managing tomorrow if universal credit leaves them with fewer pounds in their pocket, and if rising costs of living means their money doesn't stretch as far as it used to." He called on the government to help such families in this month's Autumn Statement. The Department for Work and Pensions said the number of people in relative low income had fallen by 300,000 since 2010. A spokeswoman said: "Work is the best route out of poverty. The number of children living in working households is at a record high and by increasing the National Living Wage and taking millions of people out of paying any income tax, we are ensuring it always pays to be in work."